Initiative 1639 is being promoted as a public safety measure; those actually working law enforcement know that IT WILL DO NOTHING TO STOP A SINGLE CRIME. This initiative has nothing to do with “assault weapons” and is directed only at our good citizens who already pass multiple background checks before owning a firearm. The Washington State Law Enforcement Association (WSLEFIA) opposes Initiative 1639. I-1639 harms law enforcement officers and all citizens of Washington. 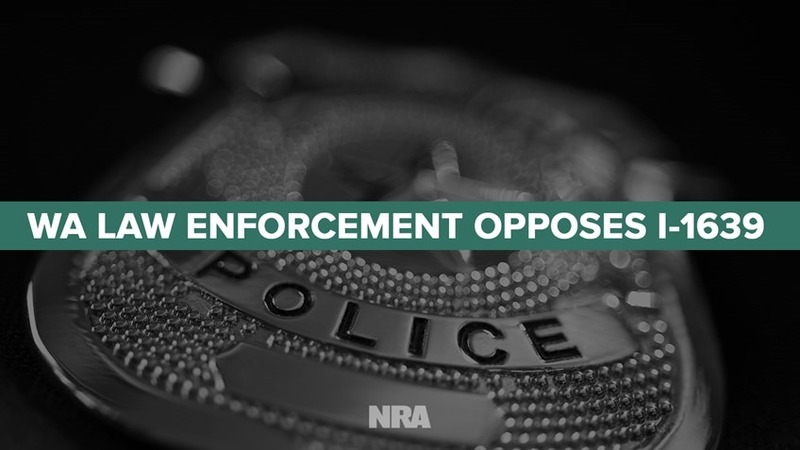 The WSLEFIA finds that I-1639 is an attack on civil rights and is an attempt to marginalize all firearm owners, including law enforcement officers. I-1639 will impair public safety, embolden criminals and impose burdensome restrictions on our most law-abiding citizens. I-1639 creates a new crime of “Community Endangerment” and there is NO law enforcement exemption. 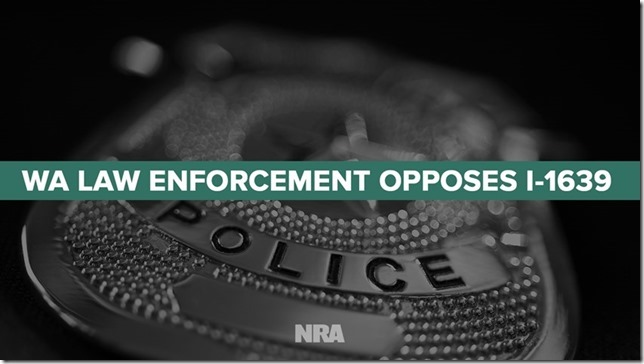 If a law enforcement officer should fail to secure either a personal or duty firearm as prescribed by I-1639 then that officer may be subject to felony criminal charges. Even a department-issued firearm must be secured with a trigger lock or in “secure storage.” The trunk of a patrol car is not specified as secure storage. I-1639 requires a 10 day wait for law enforcement officers who wish to buy a semiautomatic rifle, whether for personal or duty purposes. There is no exemption for either a commissioned officer or a Concealed Pistol License. I-1639 requires that law enforcement officers attend a “safety” training class before purchasing any semiauto rifle. There is no exemption for law enforcement commissioned personnel and no recognition of either department or BLEA academy training. I-1639 would require that a law enforcement officer who sells a semiauto rifle to another officer go to a firearm dealer and pay fees. The purchasing officer must wait 10 days, pass additional background checks, and show proof of “safety” training. I-1639 targets law-abiding citizens–not criminals–by creating a new law that would make the innocent victim subject to CRIMINAL charges if his firearm is accessed by a prohibited person. The ugliness of shaming and blaming the victim of a crime should never be made law. I-1639 ignores the criminals while attacking the victims of theft. Law enforcement officers will be made to investigate the victims of crime rather than pursuing the perpetrators of crimes. I-1639 falsely demonizes all semiautomatic sporting rifles as “assault rifles”–the rifles they wish to deny to the public are the most common sporting and hunting firearms–the type of firearms LEAST likely to be used in crimes–this fact is supported by both FBI and Washington State crime statistics. I-1639 strips adults under age 21 of their right to self-defense. Law-abiding young adults will no longer be able to possess any modern defensive firearm, neither handgun nor rifle. I-1639 attacks our safest and best-trained firearm users–licensed and safety trained hunters–by prohibiting the use of modern sporting rifles by those age 18-20. I-1639 would unlawfully seize semiauto rifles already owned by those under age 21 by prohibiting any possession or use of these rifles at target ranges and for hunting. I-1639 creates both a literacy test and the equivalent of a poll tax–they call it a fee–to exercise a right guaranteed by both State and Federal Constitutions. You wouldn’t accept this for voting or any other right and neither have the courts. I-1639 delays the LAWFUL purchase of a rifle by 10 days–even after all background checks are passed! A right delayed is a right denied. I-1639 impairs a citizen’s defense their home by requiring that the most effective defensive firearms be locked and inaccessible by the homeowner. I-1639 creates an unnecessary, costly and ill-considered requirement for government-mandated training that is already adequately addressed by Washington Arms Collectors-provided training, National Rifle Association safety instructors, WDFW Hunter Safety training and private clubs and ranges. I-1639 creates yet another huge unfunded bureaucracy that will only duplicate the background checks already Federally required. Don’t be fooled–the background check system already exists and all semiauto rifle buyers already are required to pass background checks. I-1639 will prohibit legitimate sales of rifles to fully background checked and Federally-approved purchasers from other states, thus harming all State and Federally licensed firearm dealers. I-1639 will not stop a single crime or shooting. Criminals are not subject to any of the requirements; only law-abiding citizens go through background checks and they already do so. I-1639 wrongly burdens our most law-abiding citizens while doing nothing to keep firearms out of the hands of criminals.